Nickelodeon 90s classic Rocko's Modern Life is officially back with brand new footage that debuted at Comic-Con today. The panel was a lot of fun, but the preview footage was just perfect for any fan of the Nickelodeon show. 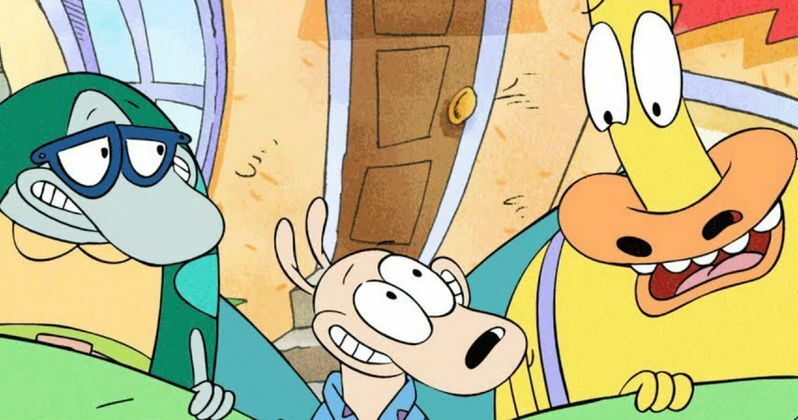 The reboot entitled Rocko's Modern Life: Static Cling, reunites the original voice cast and creator, with Joe Murray back on board for this one-off movie special that is set to air in 2018. In addition, the B-52's theme song is back and it's important to hear Fred Schneider belt out "Rocko's Modern Life!" once again. The new footage comes to us courtesy of Nickelodeon's official YouTube channel and it's a must see for any fans of the original series or even for people who aren't familiar with the antics of Rocko, Heffer, Filburt and Spunky the dog. The new movie will place Rocko and friends into the present day, returning to earth in the year 2017. We see a sendup on the iPhone craze with subtle hints of technology rotting brains. The computer attempts to eat Rocko's mind, wanting to his eyeballs as surveillance,, even chasing after Rocko and his friends. Rocko says after having his senses bombarded, "The 21st century is a very dangerous century" at the end of the clip. The official synopsis for the movie announces that Rocko's Modern Life: Static Cling brings the characters back to Earth after being lost in space since 1996. Rocko has trouble accepting this 21st century modern life, while Heffer and Filburt embrace every aspect of the new technology, social media and the endless diversity of food trucks. Rocko whole-heartedly believes that his nostalgia for the past can save him from the tortures of the modern world. The clip certainly does show the boys enjoying a "pizza taco," a "wiener taco," and a "taco within a taco" while poor Rocko gets food poisoning from the hipster food. Rocko's Modern Life aired for a total of 4 seasons from 1993 to 1996 with a grand total of 52 episodes. The series worked on both levels, for kids and for adults, often dealing with some mature content in a subtle way, masked under the guise of a children's show. The show was put together by talented animators from The Simpsons, Cool World, and Who Framed Roger Rabbit. In addition, the show worked with some then-unknown animators like Steven Hillenberg, the creator of SpongeBob SquarePants and Nick Jennings, the art director for SpongeBob SquarePants and Adventure Time. As it turns out, a lot of inappropriate jokes slipped past the censors during the 4 seasons that the show was on Nickelodeon. There was a pretty literal scene where Rocko was seen spanking a monkey. Rocko's Modern Life: Static Cling does not have a concrete premiere date, just sometime in 2018, but excitement should be a lot higher after this clip. Do yourself a favor and check out the clip from the upcoming Rocko's Modern Life: Static Cling movie below and in the meantime go check out all of the old episodes of the show.